The University of Miami Sports Hall of Fame (UMSHoF) announced today that Out the Huddle, comprised of Brett Romberg, Jonathan Vilma, Antrelle Rolle and DJ Williams, will host the Hall’s 2019 Celebrity Fishing Tournament on June 21-22, 2019 at the Miami Beach Marina. 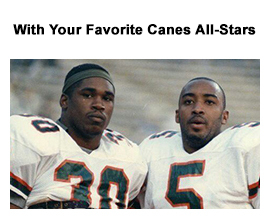 In its seven years, the UMSHoF Fishing Tournament has become one of South Florida’s premiere events…bringing Canes greats and fans together for a fun, family-friendly event. In the past, Ray Lewis, Ted Hendricks, Michael Irvin, Warren Sapp, Andre Johnson, Randal Hill, Melvin Bratton and Alonzo Highsmith have served as celebrity hosts at the tournament that has attracted hundreds of former Miami athletes. 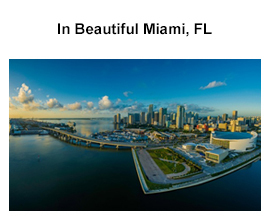 The event has raised over $225,000 for such charities as Habitat for Humanity of the Upper Keys, the Coastal Conservation Association, the Buoniconti Fund to Cure Paralysis, Shake-A-Leg Miami and the UM Sports Hall of Fame. 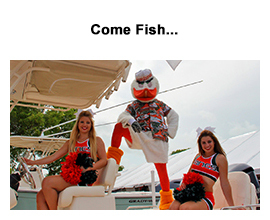 To become a sponsor for the 2019 UM Sports Hall of Fame Celebrity Fishing Tournament, contact Tournament Director Tracey Preston or go to CanesFish.com. The University of Miami Sports Hall of Fame is a non-profit, 501c3 corporation whose sole purpose is to recognize those student-athletes, coaches and administrators who have excelled at their sports and brought acclaim to the university through their accomplishments and championships. All tax-deductible donations help showcase their achievements for Hurricanes fans to enjoy for generations to come!